Seems an awful long way to go just for a curry, but I haven't seen the dweebs in ages so should be good. They have their own plane. Ed Force One and it's piloted by Bruce Dickinson. After Tim's recommendation over a year ago I finally got round to watching Chinatown. Not bad. Who do Sansburys and Nectar think I am? I've just popped to Sainsburys to grab some lunch and received 3 vouchers for using my nectar card. Who do they think I am? An alcoholic cat man? My laptop has been shipped, slight problem however. It's coming all the way from China! I should have it early next week. Yeah! I captained my rugby team on Saturday. It's not something I particularly enjoy but I guess someone had to do it. Although I only managed a half as my shoulder got knackered in the first 10 mins. We eneded up losing 3 tries to 1. All of their 3 tries were in the first half when I was playing. Can you spot a common factor there? My should seems much bette than it was Saturday night / Sunday so fingers crossed there's nothing too serious wrong with it. I watched the first half of the first episode of Legend of the Seeker (sci fi channel). What a load of tripe. I have to say I wasn't expecting anything great but come on. At least employ some actors and perhaps some special effect budget. One of the main types of bad guy they were fighting was invisible. How cheap is that? I haven't had any real time away from work since my brother's wedding last year (September) and am in need of a good rest as this year's been super hectic at work (you may have noticed me neglecting this blog). I've got a big deadline that's for next Tuesday (or actually this Friday as it needs signing off and the person who needs to sign it off is off on holiday next week), once that's done I can put my feet up for a little while. Looking at my calendar, if I take the 29th to the 31st off as holiday with study leave, bank holidays and weekends I get a total of 11 days out of the office. Yeah! Not sure what i'm going to do yet but the break will do me good. I'm going to order a new laptop this weekend. The latest one i've got my eye on is an i7, 8gb ram, 1gb graphics (not great for gaming though) and is around £1,200. I'm very tempted to have a look at what Alienware have to offer but I don't want to strech too far. I had a couple of pints of Guinness on Wednesday. Yuk! I nearly yacked after finishing off the first one, but was in the middle of getting in the next round so had to force another down. Yuk, yuk, yuk! Oh well, maybe i'll try again next year. I went to a comedy gig to raise money / awareness about libel reform on Sunday. It was put on by the same people that do the comedy for godless people gig I go to each Christmas. Although most of the jokes were the same as with the Godless gig above they were still very funny. One of the highlights was the Lib Dem MP doctor Death. Quite a funny man really. Quite happy to allow himself to be ridiculed. Still won't vote for them though. Prepare to engage smug mode. Just got my bonus letter through. Wow! Only in Scotland, but the fact that each 330ml bottle costs £40, I hardly think anyone is likely to get hammered on it. Just had another call from a recruitment consultant (second of the week). It turns out my old company are looking for capital modellers. Ha, ha, ha. I told my boss as I thought he'd find it funny and he said that he already knew. They're also looking for a head of capital modelling... yikes. I went out at lunch to buy some wrapping paper for April's birthday presents and had to go into 3 shops for the privallige. The first two only had mothers day wrapping paper, eventually I found some but it was £4. Jeez. Luckily we're due to get the new ones in this week. It's -5 in Tonbridge tomorrow night. I started reading the Farseer books (Robin Hobb) a couple of weeks ago and I have to say they’re pretty good. They’re just medieval fantasy nonsense but all good fun. I’m half way through the second book now and it’s kept me entertained. Unlike the 5th Wheel of Time book that I’ve been dredging through for over a year now. Books shouldn’t be a chore. I’ve told myself that I will finish it and the remaining 8 books at some point but that maybe when I retire as they can be so much hard work. With less and less people going to church these days it must be hard to keep the coiffeurs full after fixing all those leaky rooves. Why doesn’t the pope bless bottled water? Waiter: “Certainly Sir, still, sparkling or… Holy? There's been some sort of fire in between New Cross and London Bridge so hopefully that'll all be sorted out by tonight. 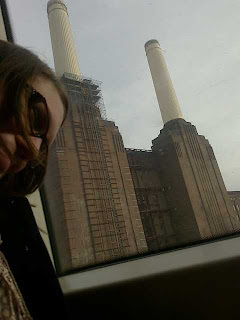 One bonus was seeing going past Battersea Power Station. April wasn't too keen to be photographed along side it on the train. I gave blood this afternoon, they were really busy so I had to wait a fair bit, but once in and seen by the nurse the pint was out of me within 4 minutes. Pretty good going. Why do I give blood? To help save people's lives? No. The greater good of the community. No. I do it for the free biscuits, crisps and a cheap night out on the lash. Will I ever grow up? "What a big fat ball of cheese"
A quote from April having just watched the first episode of the third series of the West Wing (a 9/11 special), I have to say it was a pretty poor episode. Why did the producers of the show feel it necessary to 'teach' Americans about world politics and terrorism. I thought things would get a bit quieter here this week. Oh well. Better get to it then. My appraisal's on Wednesday so fingers crossed for that. Which reminds me, I'd better get a move on with my section of the appraisal.